Another year and another list, that is how my year starts. We all have goals but reaching the goals takes determination and some planning. Let's face it it's got to be simple and you have to see progress. Loosing weight is a personal thing and what works for some will not work for others. It's basically taking in less calories so your body does not store them as fat. Your meals need to be easy and quick to prepare along with being tasty. When we need a quick nutritious meal Asian cuisine fits the bill. The cuisines of Asia rely heavily on vegetables and grains. Meats are used in moderation in the dishes. Spicing is also important garlic and chilies are essential seasoning. I was reading an article and the phase "resistant starch" jumped out at me. The article talked about resistant starch being a new way to control your calories when eating. Since I had never heard of resistant starch I needed to do some research on the subject. I would like to share what I have found. Most starches are digested and absorbed as glucose (sugar) through the small intestine. There are some types of starches that resist digestion and pass through to the large intestine, where they act like dietary fiber. This type of starch is called "resistant starch". We all know when we eat whole grains or beans there's lots of fiber and that fiber is what makes you feel full. Instead of telling folks to eat more fiber to loose weight they have developed a product that contains fiber that will give you the same effect. This new product is called Hi-maize Resistant Starch. Beans are the very best food source. Although the types of beans and preparation methods cause varying amounts of resistant starch (canned beans are more glycemic), in general, the starch in beans is about evenly divided between slowly-digested starch and resistant starch. Whole, intact grains are decent sources of resistant starch. The starch in pearl barley is about 12% resistant and 43% slowly-digesting. Bulgar wheat and long grain brown rice are similar. So what is Hi-maize Resistant Starch? Hi-maize is a natural ingredient made from a specific type of corn which is rich in resistant starch. It's naturally white in color and can be finely ground so it's easily incorporated into foods such as bread, biscuits, cereals and pasta by partly replacing ordinary flour. This trade marked product is developed from a special hybrid of corn that is naturally high in amylose. It was developed through a natural plant breeding program over the past thirty years. The corn is grown by American farmers in the central US. After harvesting, the starch is pulled out of the corn kernel through a wet milling process. It's treated with mild heat and moisture and dried to a fine, white cornstarch powder. Resistant starch is protective of colon cells and associated with less genetic damage (which can lead to cancer). Resistant starch is associated with more mineral absorption, especially calcium and magnesium. Resistant starch seems to improve insulin sensitivity with improved glucose tolerance the next day. Resistant starch leaves you feeling satisfied after eating your meal. Promotes "good" bacteria, and controls the "bad" bacteria and their toxic products. Resistant starch is a good thing, I'm just not sold on getting it thru a man made product, when it's available in many foods that are good for you. You are going to see this product used for weight control, specifically on products that you would not consider diet products. I did not find any negative information on this product. My concern is instead of learning to eat a proper diet to loose weight this product can be added to for example chocolate cake and then sold as diet food. Changing your diet is important if you are going to loose weight, it's a lifestyle change that takes work and does not happen overnight. Simply adding fiber to the product in my opinion does not make it good for you. Ever wonder why in this country more of us are over weight, than in Europe. It has to do with what we eat. They are now discovering that eating whole grain rye bread compared to whole grain wheat has some benefits in regards to controlling our weight. Wheat and Rye are made up of three components, bran, endosperm and germ. The difference is the rye has more bran than wheat. 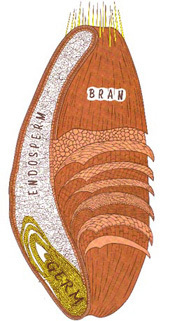 Rye berries have bran not only on the outside of each berry but also in the endosperm. This may be why it has a different effect on our bodies than whole grain wheat does. The bran fills you up without all the extra calories and stays with you longer between meals. Studies under the Health Grain project showed that rye products promote higher feeling of satiety after meals. If you feel full you tend not to return to the refrigerator for the snacks between meals. Not only does rye satisfy you after the meal but it stays with you longer, thus avoiding the snacking. In the fight against diabetes and obesity, foods that produce a low insulin response and suppress hunger can be extremely useful. A cross-over study by Scientists at Lund University in Sweden showed that the endosperm in whole grain rye bread best controlled blood sugar and regulated appetite. Dietary fiber from rye appears to be more effective than wheat, and improve general health of the digestive system. There simply is more fiber in rye than wheat. Lignans are natural components of plants found in rye and other foods that may reduce the risk of certain cancers. The added fiber in rye may also reduce the risk of colon cancer due to improved bowel function. The consumption of whole grain rye bread or rye cereals lower the risk of cardiovascular disease and risk of heart failure. It has also been suggested that the elderly by increasing consumption of dietary fiber breakfast cereals have a lower risk of cardiovascular disease. In a 4-week study of 18 men and 22 women who consumed random bread of wheat and rye, it was concluded that rye bread in daily eating habits is an effective and practical method for reducing LDL cholesterol levels in men. Another study showed that cholesterol levels were significantly higher after a diet low in fiber than following a diet high in fiber. With all these benefits to eating rye bread, why not try some for yourself. I offer two types of rye bread. A light rye with caraway seeds and a dark rye bread with caraway seeds and herbs. Both types of rye breads sell for $6.50, you can pick it up at the Farmer's Market on Saturdays or stop by my house. Losing weight is difficult, but it is critical for your health. If you are overweight, you have taken the first step toward a healthier life by identifying that you need to lose weight. Certain foods can help you reach your goals by satisfying your hunger for fewer calories than your usual choices, as well as preventing hunger so you end up eating less food overall. Whole grains are packed with fiber, which fills you up and gives you lasting energy. Mayo Clinic reports that high-fiber foods, like whole grains, take longer to digest so you can stave off hunger, reduce your caloric intake and shed excess weight. 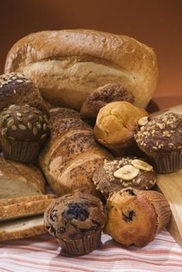 There is also evidence if you eat whole grain foods you will burn 4% more calories every minute of every day. The effect is double you will feel fuller so you eat less and your body has to break down the food so it works harder and burns more calories in doing so, a win - win situation. Replace your usual grain foods with whole-grain alternatives. Opt for a whole-grain breakfast cereal or make your lunch sandwich on whole grain bread. Substitute white pasta for whole grain versions. You will find that you end up eating less food because the fiber in these whole-grain foods fills you up faster so you take in fewer calories. Include whole grains in each of your meals. I find not having sweet temptations around with easy access is key for me. When I make cookies or any treats I freeze them that way I have to think twice before eating them. When I must have an afternoon treat I set out my treat at lunch so it will thaw that way I don't feel deprived, dieting is a mind set. Keeping control of the number of treats is very helpful for my will power. A simple sweet treat that satisfies is chocolate covered prunes. Use regular or the flavored variety prunes and melt chocolate bark or a mixture of chocolate chips and bark and then toss the prunes into the melted chocolate. Lay on a cookie sheet to set up. Just one after dinner gives you a nice sweet treat that tells your body your done eating. When you eat is very important. Always have breakfast and make it your largest meal. Eat a large lunch and your evening meal the smallest meal of the day. This does take some getting use to but it's a simple change that has big payoffs. We eat nothing after dinner which is 3 hours before going to bed. This gives your body time to burn the calories, before you lay down for the evening. This is also very helpful if you suffer from acid reflux like I do. If you follow these 3 easy steps you will find you are not as hungry and the pounds will start coming off, of course exercise helps but start with simple steps so you don't get to over whelmed.